Here's a card I made using TAC's new "Linear Sentiments" stamp set. This set really is versatile and it'll make great masculine (and feminine) cards & scrapbook pages. I stamped the stars and then cut them out, outlined them with black noir palette ink and popped each of them up on pop dots. The bottom patterned paper is made using 2 of the border strip stamps from this set. I then distressed the top and bottom edges and lined them with noir palette ink. After I finished stamping the panel, I then took a stipple brush, lightly dabbed it onto the noir ink pad and then touched it to the panel to add black "splashes" (for lack of a better term!). Here's a simple card I made using the new Angel Company "Friendship Strips" and "Linear Sentiments" stamp sets. This is just a small card. It only measures 3 x 3. I took the new Super Jumbo flower punch and punched through a piece of acetate. Then, I used Iris Palette ink and the "Curls & Swirls" stamp set and stamped onto the acetate. I heated it carefully with my heat gun to dry the ink and then took New Canvas (white) Palette ink and dabbed the edges of the petals to help it stand out. The orange strip is one of the images in the "Friendship Strips" set (LOVE this set!!). The ink color is VersaMagic Persimmon and it is stamped on the TAC Ivory cardstock. (This ink color is gorgeous.) I distressed the edges and lined them with the Palette Belle Rose ink. The center of the flower is from the "Linear Sentiments" set and after I stamped it, I used a 1" hole punch to punch out just the size I needed (the whole stamped circle was larger than I needed) and then adhered it to the acetate. The flower is popped up using pop dots and you may be able to see the dimension better on this side view. The sentiment is from the "Ordinary Greetings" set. Another layout of my darling Sadie! I love some of these pictures so much (sorry one side of this is so much darker--I just couldn't get the lighting right). I wanted to share some of the elements I used on this page. Here you can see how I used a scalloped circle punch and then used a circle punch to punch out the scallop's center creating a scalloped ring. Next, I tied pieces of ribbon around the circle. I unified the pages using this same theme on both pages. You can also see the title up a bit closer. I used the TAC alphabet stamp set "Fancy Bet" for the blocks and then used my souffle pens to add the color. I used the paper distressor to make the edges "frizzy" and then took my ink pad and inked each side. The rest of the title was stamped with the "Simple Bet" alphabet set. The next photo focuses on the border strip. This is from my favorite new stamp set called "Friendship Strips". I stamped this stamp 3 times with Claret Palette ink to make a continuous strip and then used the edge distressor to distress the edges and add the "frizzy" look again and then inked each side. I also stamped with VersaMark ink onto the green paper with the "Curls & Swirls" set to make the swirlies look like a watermark. Here's page 2. I tied the pages together using the circles even though this page is mostly just filled with photos. Here at the bottom you'll see the scalloped border strip which you can mimic by using your scallop scissors (or corner rounder punch) and then taking a hole punch and punching a hole at each scallop. This is a elegant look for both scrapbook pages and cards! You'll also notice that I stamped the "Date Disk" stamp onto cardstock and then used a pop dot to give it dimension after I tied a ribbon through a punched hole. This is one way to change up the disks and make them look unique on a number of pages. Well, thanks for taking the time to stop by! I hope to share a card using the "Friendship Strips" set soon! Look what The Angel Company is giving away! You must sign up by 11:59 pm, on July 31st. The winner will be notified by e-mail, as well as by phone. I wanted to share another scrapbook page with you today. I incorporated several new items from The Angel Company in this layout. You'll notice the white scalloped border along the top of both pages. That is the new cardstock strips that TAC is carrying. I love them! The come in 6 different colors, but I started with white so that I could stamp on them or ink them however I desired. The packages contain 20 pieces in different styles and they are only $3.95. You might also notice that I used Claret Palette ink around the edges of the scalloped borders to give it definition and help it stand out. The flowers I used are from the new embellishments jars, the bitty blossom assortment and paper posies. In the center of the blue flower you'll see one of the polo button brads. You'll also notice the stamping across the top and bottom of the layout. It's just a thin stamped border but it adds a little visual interest. This is one of the stamps in the new "Linear Sentiments" set. 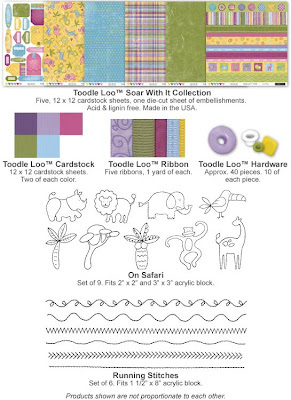 It's great for both scrapbook pages and cards! The closeup below features the "Just a Note" set which was a hostess set in the last catalogue but is in the retail section now. I love this set! I used the same image twice on this layout. I also used a flower shaped button from the new embellishment jars that TAC is carrying. Love those too!! I stamped the "Just a Note" journaling image on the Bazzill Orange paper (although it looks kind of yellowy in the photo) that TAC carries. I love this paper too!! It is a great quality, textured cardstock and comes in a variety of colors.